David Dale (1829-1906),1st Baronet was an English industrialist. 1829 December 11th. Born at Murshidabad, Bengal, the younger son of David Dale, an employee of the East India Company and judge of the city court there, and his wife, Ann Elizabeth, daughter of the Revd George Douglas of Aberdeen. Dale's great-uncle was David Dale, the Glasgow banker and philanthropist, whose daughter married the socialist Robert Owen and was mother of Robert Dale Owen. His elder brother, James Douglas (1820–1865), joined the Indian army on the Madras establishment, and became lieutenant-colonel. Dale's father died on board the Providence on 23 June 1830, during the voyage home with his wife and children. Mrs Dale became a member of the Society of Friends in 1841, and died in 1879. Dale was educated privately at Edinburgh, Durham, and Stockton. Brought up among Quakers, Dale remained a member of the Society of Friends until the late 1880s. Dale's adult career began in the office of the Stockton and Darlington Railway, and in 1852, at the age of twenty-three, he was appointed secretary to the Middlesbrough and Guisborough section of the line. On 27 January 1853 he married a widow, Annie Backhouse Whitwell, née Robson (d. 1886), who already had two children; another son and daughter were born to them. In 1858 Dale entered into partnership with William Bouch and became lessee of the Shildon Works; the partnership ended in the early 1870s. Henceforth his activities rapidly expanded. He was concerned with the formation of the Consett Iron Co, of which he was appointed inspector in 1858, subsequently becoming managing director in 1869 and chairman in 1884. In 1866 he embarked on extensive shipbuilding enterprises in co-operation with the firms of Richardson, Denton, and Duck of Stockton, Denton and Grey of Hartlepool, and T. Richardson and Sons of Hartlepool, who combined together with a view to amalgamation. Dale became vice-chairman of this ambitious undertaking, but the union was not successful, and the companies reverted shortly afterwards to their former independent positions. Dale retained an interest in the two first-named concerns. He was also managing partner of Pease & Partners Ltd, and chairman of companies working iron ore mines near Bilbao in Spain. In 1881 he became a director of the North Eastern Railway, having previously served as director of the Stockton and Darlington Railway, and on the formation of the Sunderland Iron Ore Company in 1902 he was appointed chairman. 1906 April 28th. Died. He died as chairman of the Consett Iron Co and the mining firm Pease and Partners, and as a director of the North Eastern Railway Company. Dale owes his main distinction to his pioneer application of the principle of arbitration to industrial disputes. Sir DAVID DALE, Bart., Past-President, died at York on April 28, 1906, of heart affection whilst on his way back to West Lodge, Darlington, from a visit to the Continent for the benefit of his health. He was born on December 11, 1829. He came of a family several of whose members have been distinguished in industrial and commercial history, his great-uncle having been David Dale, the well-known Glasgow merchant and banker, who introduced cotton-spinning into Scotland. His father was Judge of the City Court of Moorshedabad in the Province of Bengal, and there he was born. His father having died in 1830, Darlington became the home of his mother. He was educated at Edinburgh, Durham, Stockton, and Darlington. His business training was obtained by passing through all the departments of the Stockton and Darlington Railway Company. He quickly grasped the requirements of trade, and he showed such conspicuous business aptitude that, when little more than twenty years of age, he was appointed secretary to the Middlesbrough and Guisborough section of the Stockton and Darlington railway system. He subsequently joined the late Mr. William Bouch in a contract for working and maintaining the locomotive engines and trucks of the Stockton and Darlington Railway. This business was carried on under the designation of the Shildon Works Company, the headquarters of this large undertaking being first at Shildon and later at Darlington. Withdrawing from this contract after some years of successful working, he was appointed the managing director of what had by this time become the Darlington section of the North-Eastern Railway. This position he resigned in 1872 to become the managing partner of Joseph Pease & Partners' extensive colliery firm, and of J. W. Pease & Company's important ironstone mines. When these concerns were converted into a private limited liability company under the designation of Pease & Partners, Limited, he became the vice-chairman, and subsequently the chairman. In 1858 he was appointed an inspector in the interest of leading creditors of the great ironworks at Consett, then carried on by the Derwent Iron Company. When that concern was formed in 1864 into the Consett Iron Company, Limited, he became a managing director, and subsequently the chairman of the company, which position he held until his death. This led to his also becoming chairman of the Consett Spanish Ore Company, Limited, and, in 1879, of the Orconera Iron Ore Company, Limited, the most important of the companies working iron mines near Bilbao. More recently he was appointed chairman of the Dunderland Iron Ore Company, Limited. 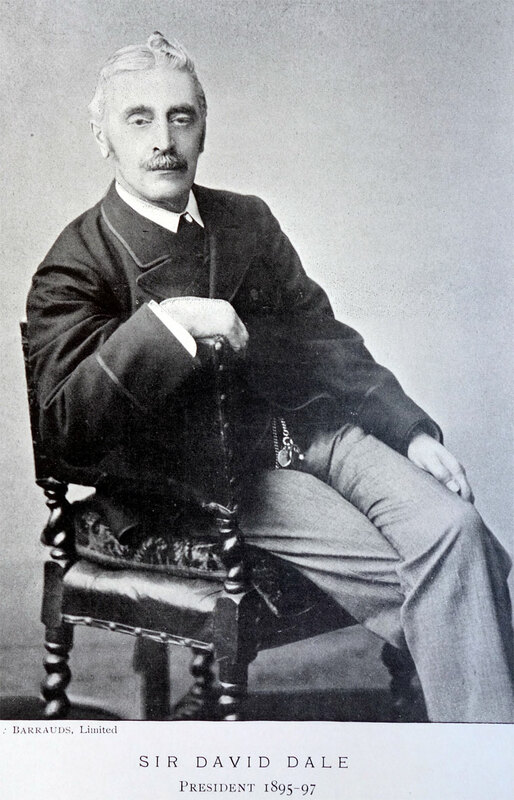 In 1881 his connection with the railway interest was renewed by his being appointed a director of the North-Eastern Railway Company. He was at the time of his death chairman of that company's Ways and Works Committee. He was also a director of the Barrow Hematite Steel Company, Limited, and chairman of the Weardale and Shildon Water Works Company, a very large undertaking supplying water to the greater part of the county of Durham. He was an active member of the Durham Coal Owners Association, and of the Cleveland Mine Owners Association, and was chairman of the joint committee of the Cleveland Mine Owners and Miners Associations. He was also chairman of the Durham Coal Trade Conciliation Board, and chairman of the Board of Examinations for the Mining District of South Durham and Cleveland. Arbitration was still young when it was determined to apply it to the iron trade of the North of England in 1869. The first Board of Arbitration was formed in March 1869, and Sir David (then Mr.) Dale was chosen President. The success of the Northern Board of Arbitration in the iron trade was in a large measure due to the tact, firmness, and discrimination of its president. In recognition of his valuable services to that Board he was publicly presented in 1881 with an address and a portrait of himself, painted by Mr. W. W. Ouless at a cost of 500 guineas, subscribed for by the representatives of every firm connected with the Institution. Sir David's connection with the Board continued as standing "referee" until his death. He was created a baronet in 1895. Prior to this he had served on several important Royal Commissions, chief amongst which were the Royal Commission on Trade Depression, 1885-86; the Royal Commission on Mining Royalties, 1889-93; and the Royal Commission on Labour, 1891-94, and was chairman of one of the three sections of the last-named Commission. To this arduous inquiry he devoted more than three years of assiduous attention. He was also one of the representatives of Great Britain at the Berlin Labour Conference of 1890. He was an active promoter of conciliation and arbitration in various leading trades throughout the country, and acted very frequently as arbitrator in important industrial disputes. Sir David was a justice of the peace and a deputy-lieutenant of the county of Durham. He served as Alderman for that county, and in 1888 he was High Sheriff. He received the honorary degree of D.C.L. of Durham University. Sir David was one of the most zealous advocates of the movement for forming the Iron and Steel Institute in 1869, and acted as hon. treasurer from its inauguration until Isis election as President in 1895. His presidential address embodied a remarkably comprehensive statement of the progress of the iron and steel industries as indicated by the evidence afforded by statistics, and has proved a work of reference of far-reaching value. 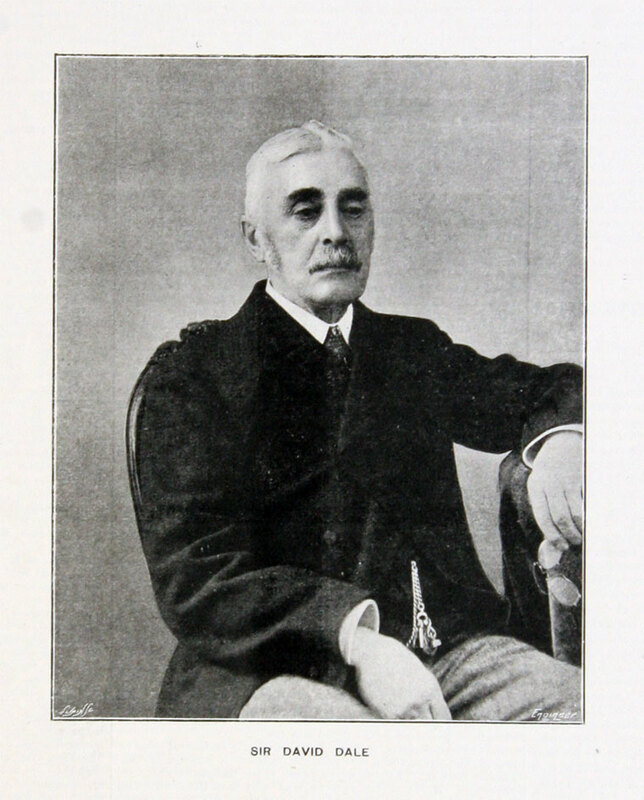 Portraits and memoirs of Sir David Dale were published in the Engineer (May 4, 1906, p. 443), Engineering (May 4, 1906, p. 589), Iron and Coal Trades Review (May 4, 1906, p. 1483), Ironmonger (May 5, 1906, p. 177), and other technical journals. This page was last edited on 30 January 2017, at 03:03.